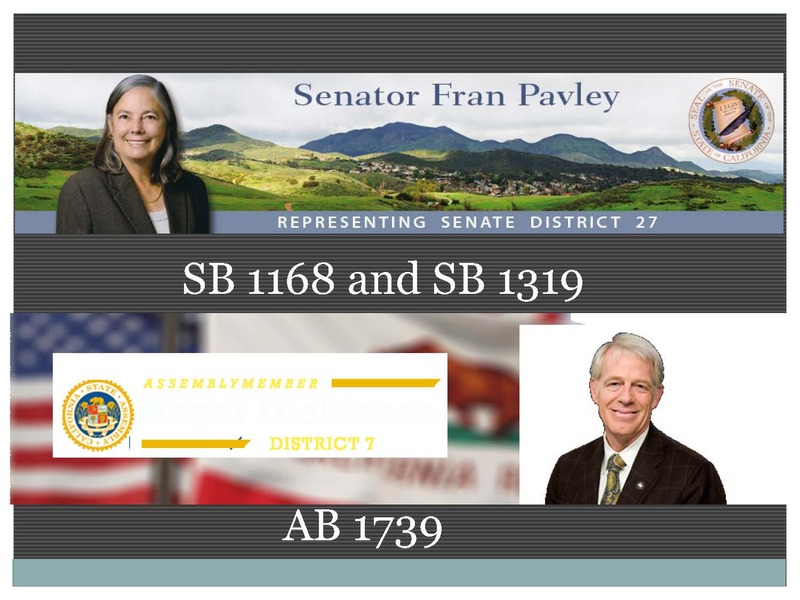 In this panel presentation, Tina Cannon Leahy, Erik Ekdahl, Professor Richard Frank, and Eric Robinson discusses the Sustainable Groundwater Management Act, focusing in on SGMA’s effect on water rights, and the interactions of groundwater and surface water. 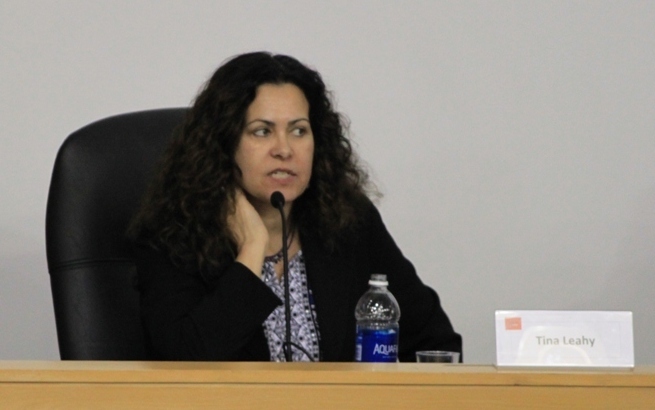 The panel began with Tina Cannon Leahy giving a brief overview of groundwater. 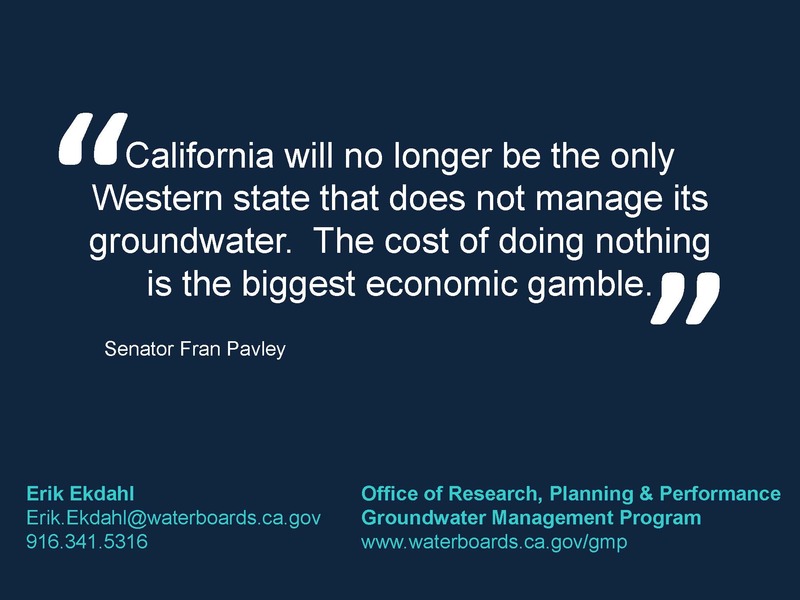 Groundwater is one of California’s most precious resources, comprising 40% of the water supply in a normal year, and up to 60% or more in a dry year. 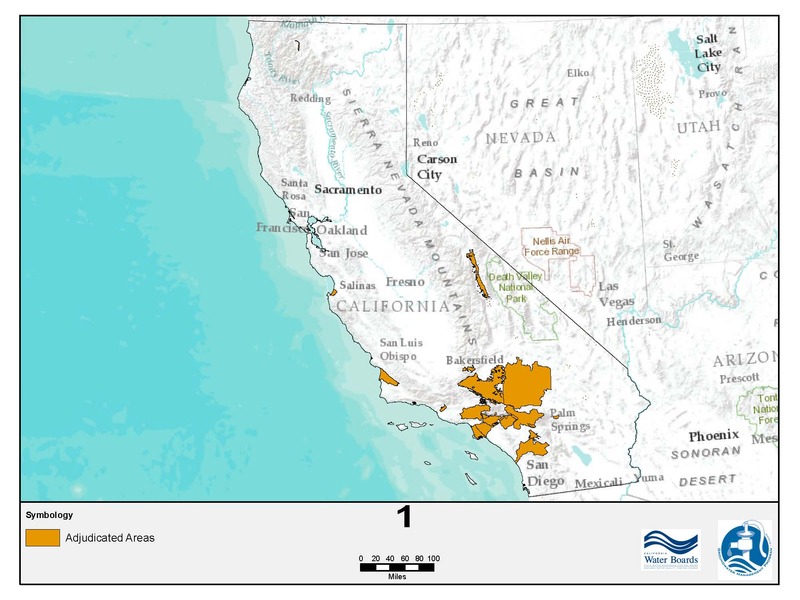 Although California is the largest user of groundwater in the nation, it was the last to adopt a statewide groundwater management act. 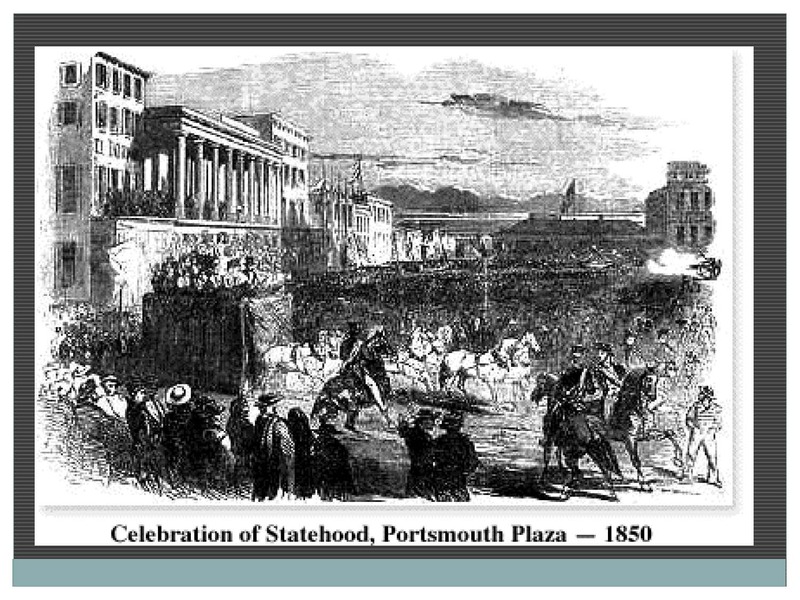 When California became a state in 1850, it passed an act adopting English Common Law as the rule of decision in all areas not covered by the U.S. Constitution, the California Constitution, or its newly passed state statutes, and groundwater fell under this by default. 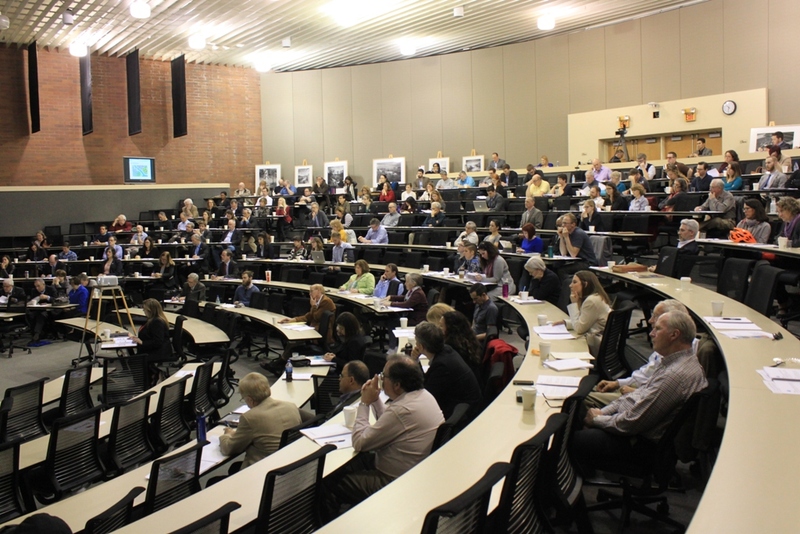 The legislature continued to tackle groundwater. Ronald Robie and his boss, Carly Porter recognized there were some areas that were overdrafted, but they stopped short of recommending legislation. It would be in 1978 in response to another severe drought that Governor Jerry Brown in his first term established a commission to review California water rights law. 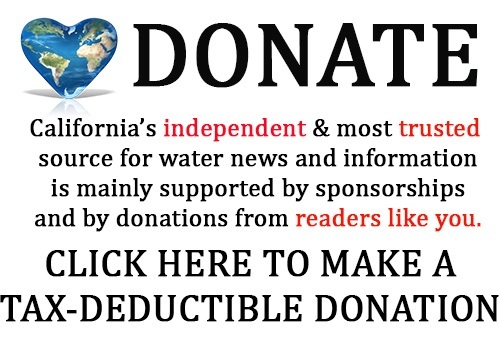 “This was another near miss for groundwater because in their final report, among other changes, they recommended a new law for statewide groundwater management that would be locally driven, but with a significant role for the State Water Board as a backstop, but that statute was not pursued,” said Ms. Cannon Leahy. 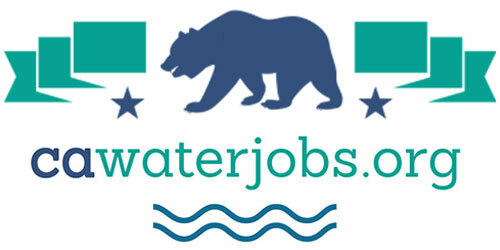 During 2007 to 2009, there was another drought, and Governor Arnold Schwarzenegger convened a special legislative session to tackle water issues unresolved in the regular session. 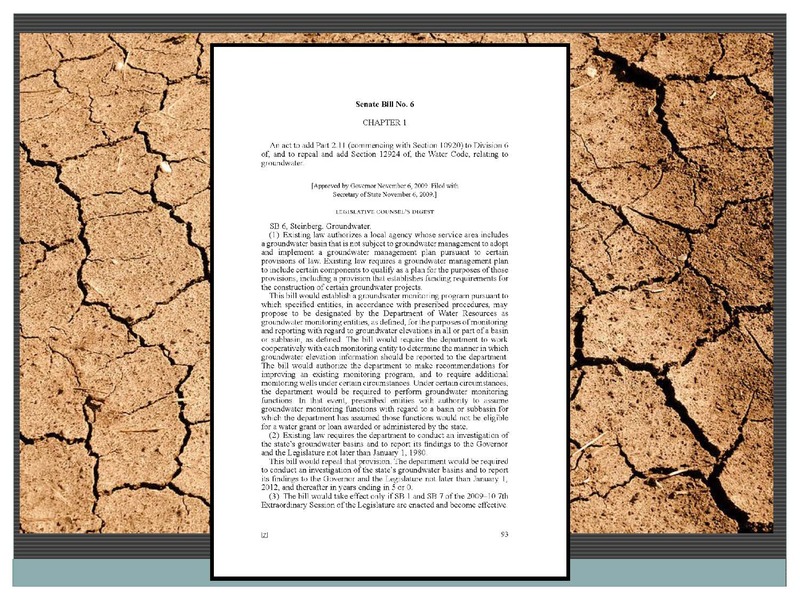 SB 6 by Darrell Steinberg was part of an ultimate five bill package that emerged that required regular and systematic local measurement of groundwater basin elevation. “When I was at the legislature people would say to me, ‘Why didn’t they require more?’ And I would respond, ‘It was a bill and it had the word groundwater in it.’ That alone was amazing,” Ms. Cannon Leahy said. 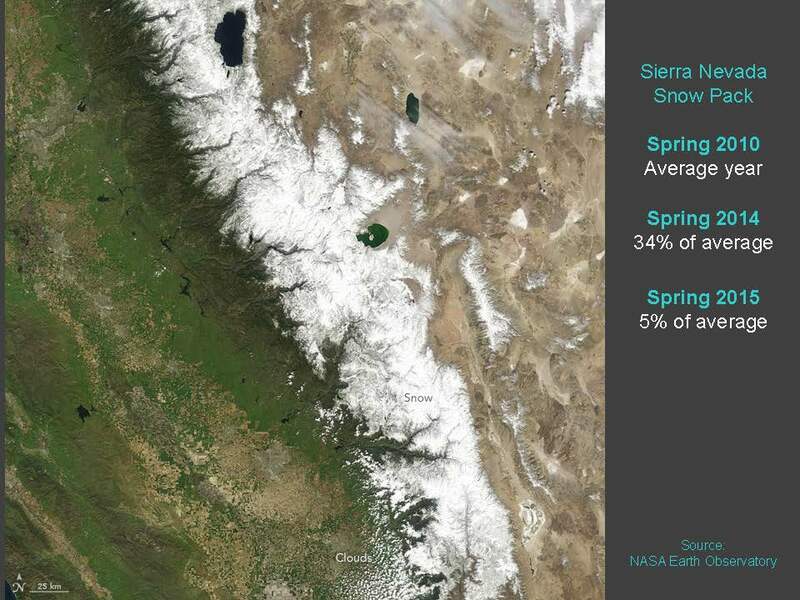 In 2012, another severe drought begins, and Jerry Brown is governor for a historic third term. 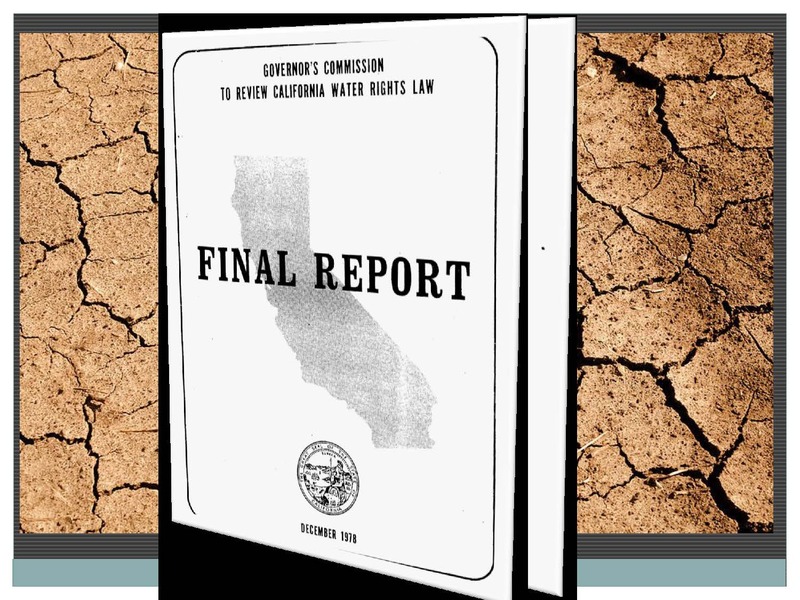 In January 2014, he declares a drought state of emergency, and relying on the State Water Board’s Waste and Unreasonable Use and Public Trust authorities, which Rick is going to talk about further, the governor includes in his newly released California Water Action Plan, directions for the State Board to step in where locals are unwilling or unable to manage their groundwater basins. 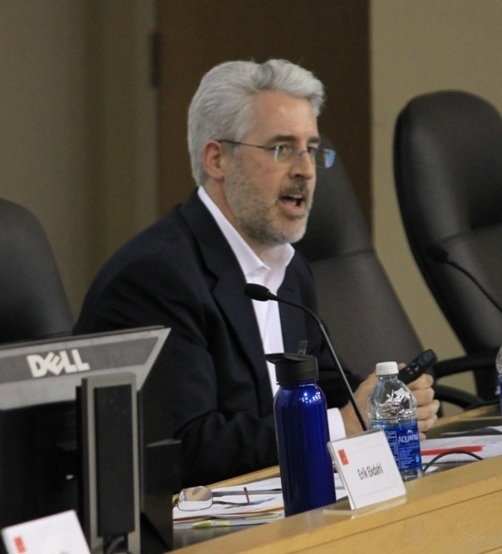 “This sent shockwaves, I think, though the stakeholder community,” Ms. Cannon Leahy said. 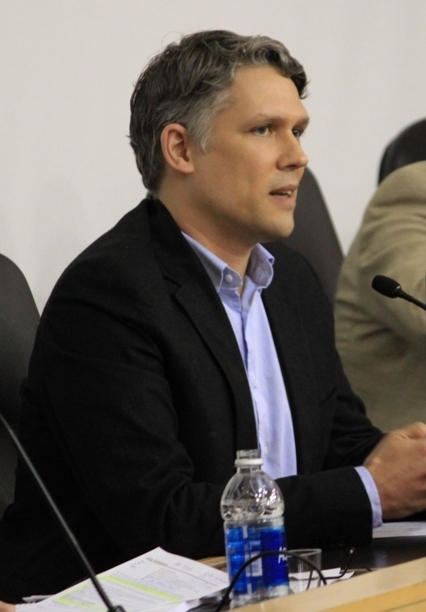 Erik Ekdahl is the Director of the State Water Board’s Office of Research, Planning, and Performance, which is the office that manages the board’s responsibilities under the Sustainable Groundwater Management Act, emergency conservation regulations and long term water efficiency efforts. 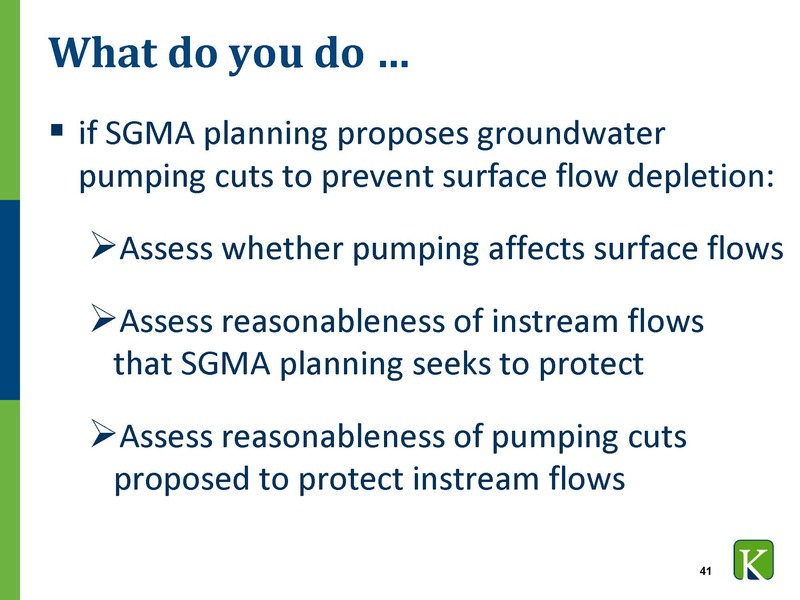 Mr. Ekdahl began by noting that he’s a geologist by training, so he would be giving a technical look at how we got to the legislation, focusing on what existing management approaches we had for groundwater, and how that really helped culminate in the passage of SGMA . Population: He presented a slide showing the growth of California’s population in millions and pointing out the point in time when Oroville Dam was completed; it was 1968 and the state’s population was 18 million people. He noted that Oroville is significant because it was the last big component built for the State Water Project; while other projects have come online since then, Oroville Dam really marks the completion of California’s plumbing system. Since that time, the state has added 20 million people. “In terms of how much more water we need just to serve those 20 million people, an acre-foot of water is enough for between four and five people, so roughly we’ve hardened the demand in California just simply through population increases alone by about four to five million acre-feet,” he said. Drought: The historic drought of recent years, when precipitation dipped as low as 5% of average. It was an event of unprecedented magnitude. The layering on of the population increase, the hardening demand for water in both urban and agricultural use, and the drought causing a dramatic decrease in the overall water supply, the consequence was that many had to rely on groundwater far more than a normal year. 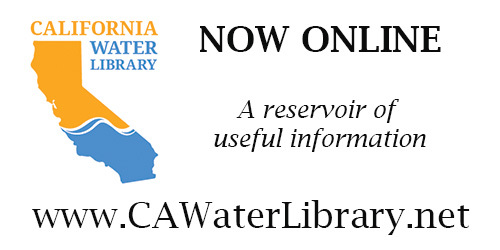 Over the last hundred years, working within California’s existing water law structure, a series of approaches were developed to manage groundwater. 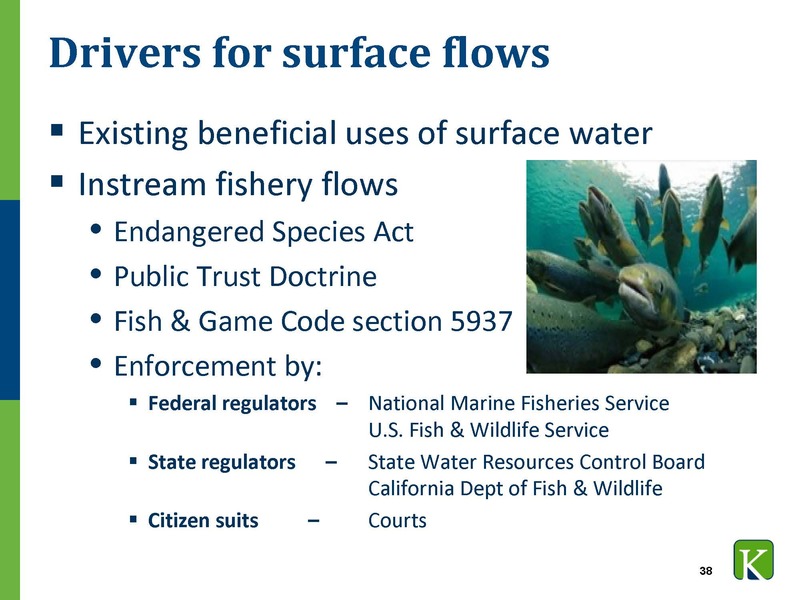 They include overlying rights, adjudications, special act districts, subterranean streams, and SGMA. Mr. Ekdahl then explained each of these in detail. 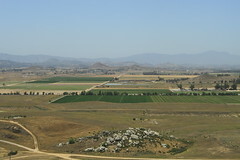 Typically, groundwater in California is managed through an overlying right. To put it simply, there is a group of landowners in a basin; they get a share of that basin’s safe yield, which is basically how much can be pumped from a basin compared to how much is recharged in a given year. The Sustainable Groundwater Management Act legislation specifically exempts 26 existing adjudications, as well as three that are pending; they are predominantly located in Southern California. Mr. Ekdahl noted that the Owens Valley is technically not an adjudication, but it’s treated as one in SGMA because it is subject to a long-term agreement between L.A. DWP and Inyo County. There are a number of special act districts, which are places where the legislature has essentially provided additional authorities under what might normally be found in statute to a group of public agencies or a certain set of groups. 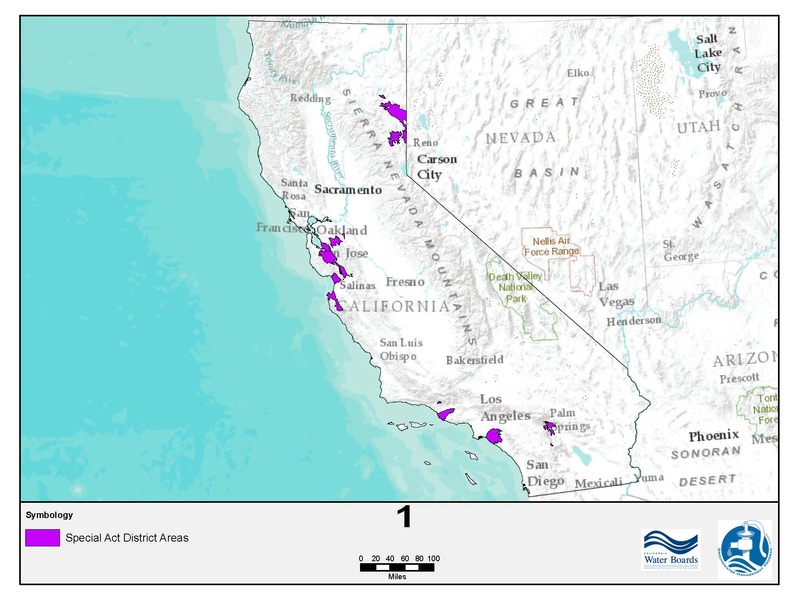 There are fifteen of them named in California and two formed by legislation last year specifically to create groundwater sustainability agencies for SGMA. Special act district are distributed throughout the state of California. Subterranean streams are a legal creation by the state of California. They’re based on a four part test that there’s a subsurface channel, there’s impermeable bed and banks, the course of the channel can be easily determined, and the water must be flowing in the channel. SGMA creates a structure in which that water, if it comes from groundwater, has to be sustainably managed, he said. Extractions in groundwater basin over the next 20 years have to get to a place where what goes in, roughly, equally what comes out. 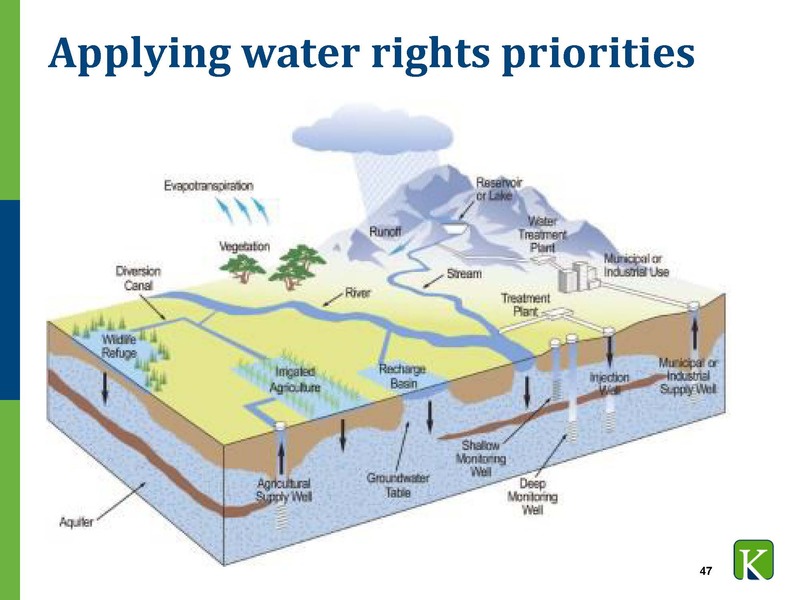 It requires the establishment of a Groundwater Sustainability Agency, which will be directly responsible for developing plans that will manage groundwater extractions in that basin. “The problem is right now we’re heading towards a scenario, even in these 127 basins, where we estimate that there’s probably going to be between 300 and 400 GSAs, each one jockeying for their own slice of the pie, each one trying to establish themselves in a scenario where they don’t lose out in the end,” he said. 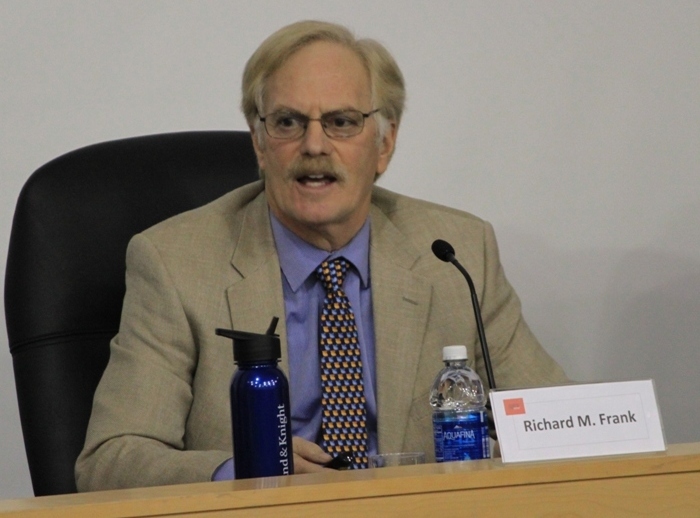 Richard Frank is Professor of Environmental Practice and Director of the California Environmental Law and Policy Center at UC Davis; he teaches California courses in the environment law curriculum; prior to that, he practiced law with federal and state agencies for 32 years. Finally, for the first time, the law recognizes the connection between surface water and groundwater. 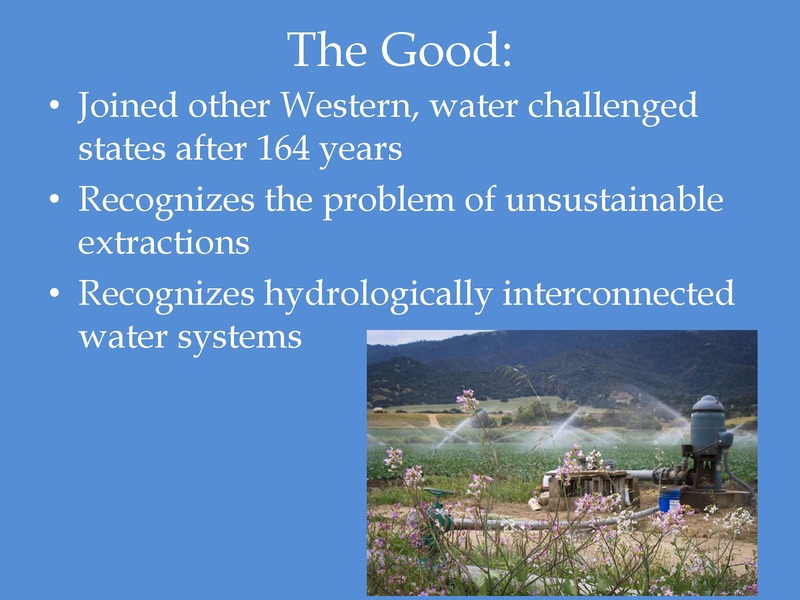 “SGMA, for the first time, begins through several legislative findings to recognize that there often are inextricable links to surface water and groundwater, and that growing recognition of trying to bring the law of the groundwater more into the present along with the science and engineering of groundwater is a very welcome thing,” he said. Mr. Frank acknowledged that it was an extraordinarily heavy political lift to get it done, and that it would not have happened but not for the multiyear drought that really brought into very sharp focus the great crisis that the state’s groundwater resources were facing. 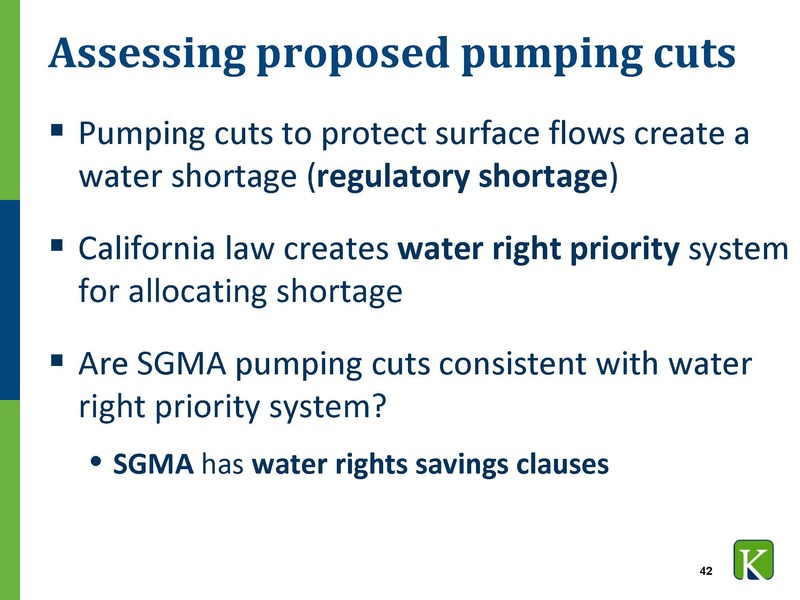 With respect to the bad news for SGMA, Mr. Frank said the law perpetuates and in many ways increases a disconnect between the way California regulates surface water supplies and the way it prospectively is going to regulate and manage groundwater supplies. 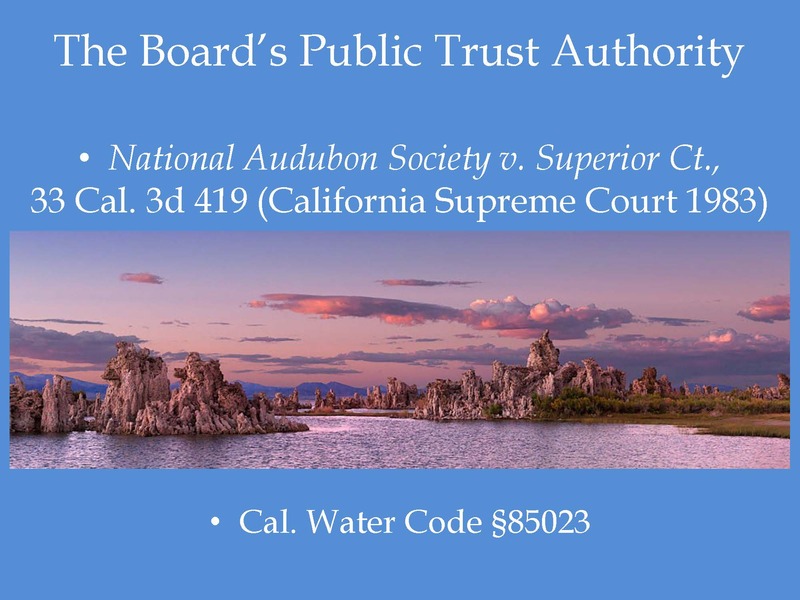 The State Water Board has the authority to intervene and take over the management of a groundwater basin if no groundwater sustainability agency is created by June of this year; if the groundwater sustainability agencies don’t adopt a groundwater sustainability plan by either 2020 for the most seriously overdrafted basins or by 2022, or if the groundwater sustainability plans that are adopted are deemed by the state to be legally inadequate. 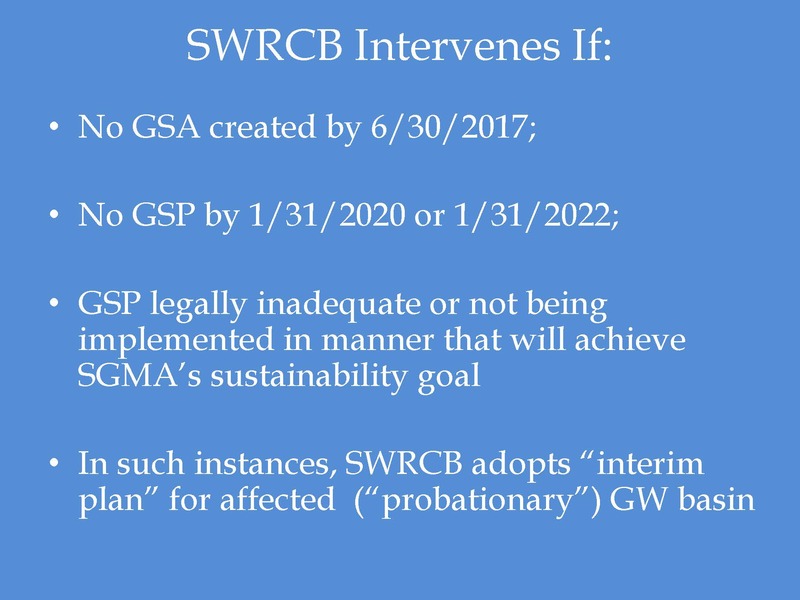 Another oddity of SGMA is that the principal responsibility for determining the adequacy or inadequacy of a particular submitted groundwater sustainability plan rests not with the Water Board but with DWR, which is supposed to make the principal determination “in consultation” with the State Water Board, whatever that turns out to mean, Mr. Frank noted. However, there are other management and legal tools that the Water Board can use to deal with the crisis facing the state’s groundwater resources. Those include Article 10, Section 2 – the reasonable beneficial use provision in the constitution and the public trust doctrine. 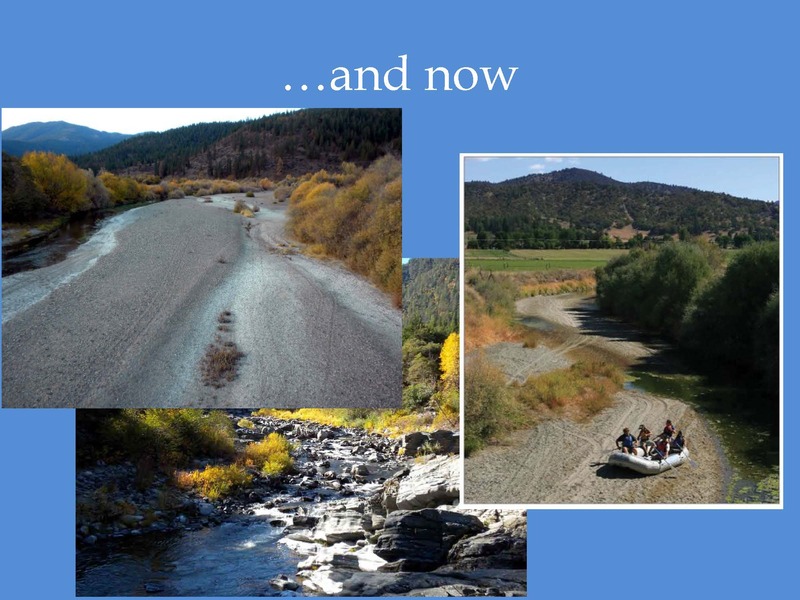 “A very important case involving the Russian River and surface water rights a few years ago, Light versus the Water Board, reiterated what I think a lot of us already knew to be true which was that those principles applied fully to all water rights in California, not just for those appropriative water rights for which the Water Board has a permit system,” he said. Eric Robinson, is a shareholder and manager of the Water Resources Practice Group at Kronick Moskovitz Tiedemann & Girard in Sacramento. His practice involves helping public and private clients negotiate and perform water transfers and groundwater banking transactions. The marriage of managing surface water and groundwater comes in the provision of SGMA that details the content of the groundwater sustainability plans that have to be adopted in the 127 high and medium priority basins that are subject to SGMA. Basically the entire San Joaquin Valley is considered high or medium priority; some basins are in critical overdraft, which means those basins must adopt groundwater sustainability plans by 2020, which is two years earlier than other basins considered high or medium priority. He then presented a slide to illustrate interrelated groundwater and surface water systems. The top left graphic shows a hydrologic scenario where the groundwater surface elevation (the water table) is so high that it is pushing water through the permeable sands and gravels into the stream; this is called a gaining stream. 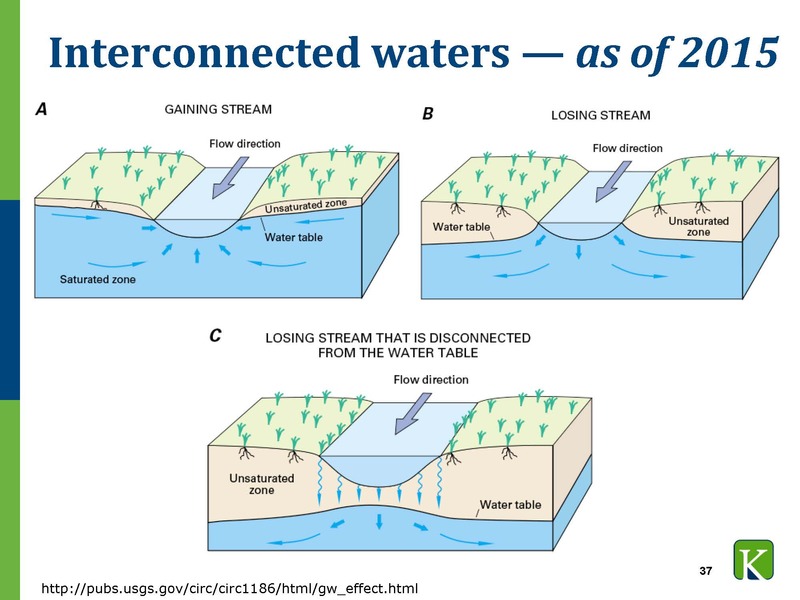 The graphic on the right shows is a circumstance where the water table has fallen and instead of the groundwater pushing into the stream, the water in the stream is leaking out into the groundwater system. 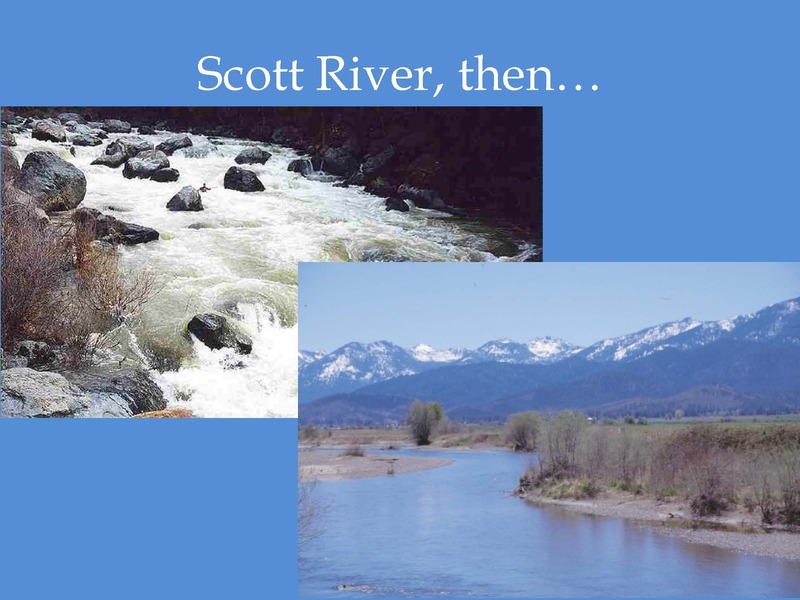 The graphic on the bottom shows the same situation but it’s more extreme – the groundwater level has fallen to the point where it’s no longer in direct physical contact with the surface stream. Mr. Robinson posited the question of whether the regulation of pumping affecting the surface flow is reasonable. “If we’re thinking about restricting groundwater pumping to protect surface flows, it’s basically going to create a regulatory shortage where by regulation, it will create a shortage to the developed land uses ag or urban, that have been reliant on that groundwater pumping, so that’s a regulatory shortage,” he said. 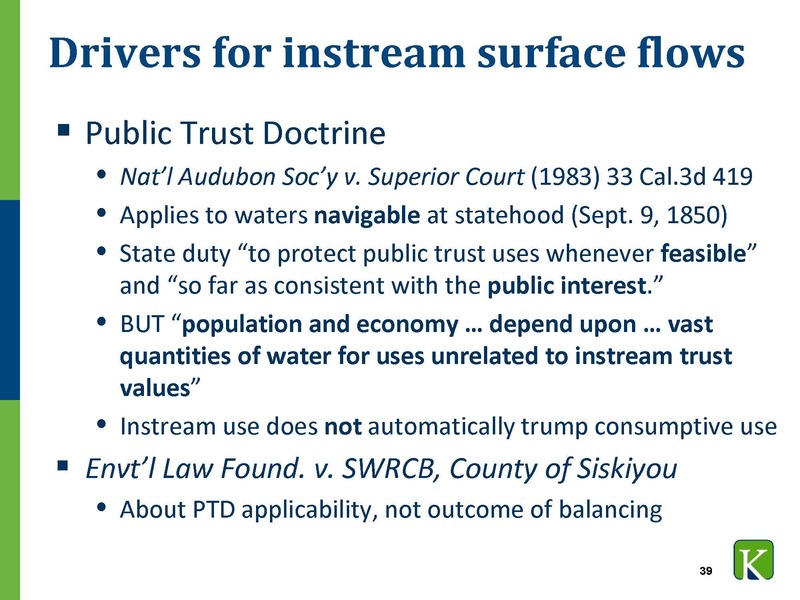 Mr. Robinson pointed out that the Sustainable Groundwater Management Act contains multiple clauses that recognize that the law does not change groundwater rights and does not authorize a Groundwater Sustainability Agency to determine groundwater rights. 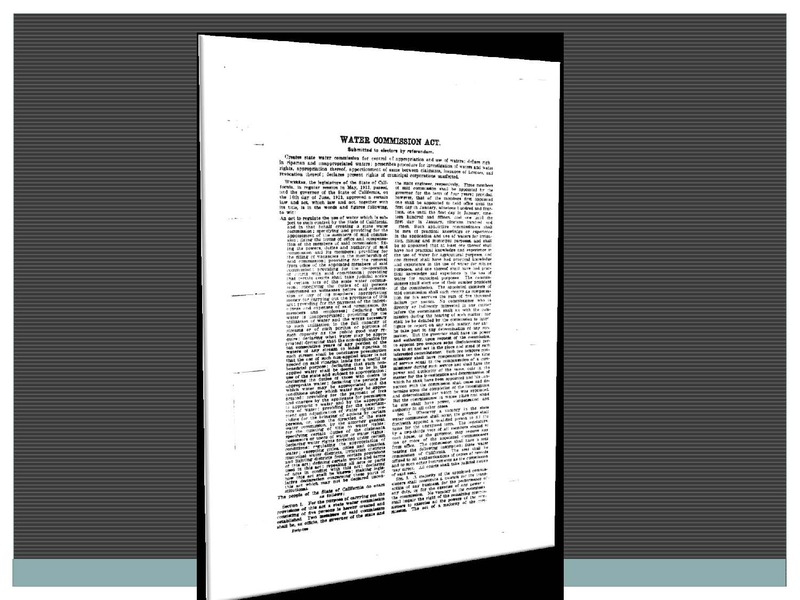 However, there are different kinds of rights, he noted, such as land-based rights include riparian and overlying rights and use-based rights such as appropriative rights and prescriptive rights; there are rules for applying these. 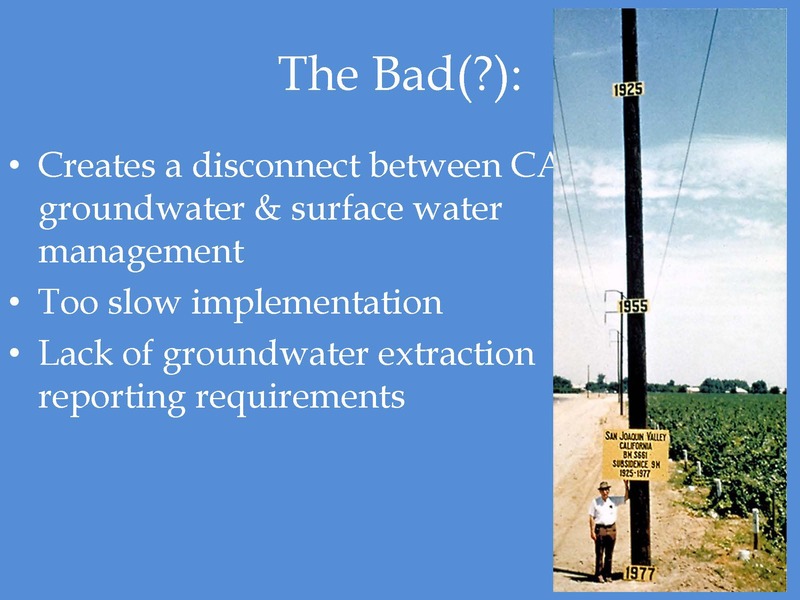 Mr. Robinson noted that this has happened in California in instances where existing institutions weren’t quite getting it right in terms of groundwater management, and adjudication was initiated in order to create a new institution to manage the basin. 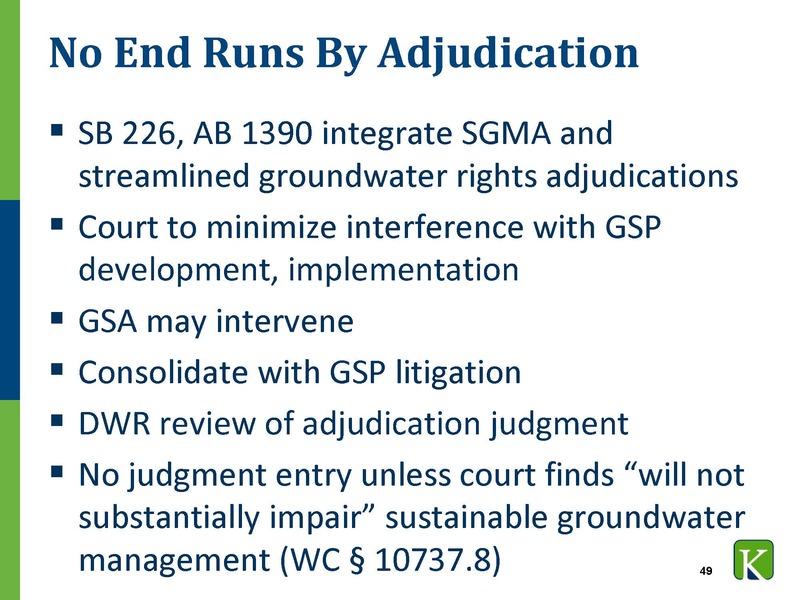 So in order to prevent this end run, the legislature enacted legislation that integrates SGMA with groundwater adjudications and creates a streamlined approach for prosecuting comprehensive groundwater rights adjudications. 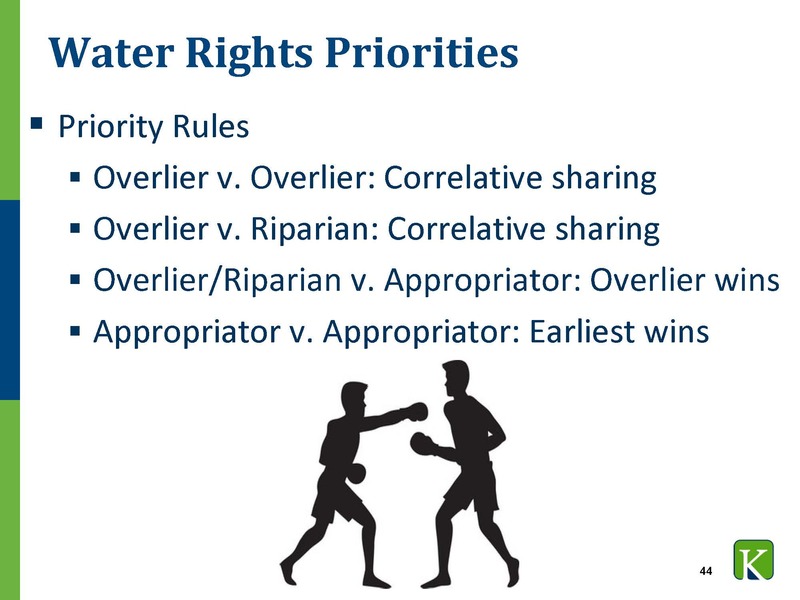 “If there is litigation challenging the groundwater sustainability plan, this new statute says that that can be consolidated, that is, assigned to the same judge that is overseeing a groundwater rights adjudication, so you bring a challenge to the groundwater sustainability plan in front of the same judge who is also overseeing the groundwater rights adjudication,” he noted.